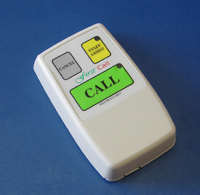 For many years (since about 1983) VCI has supplied fixed wall transmitters for use in aged care facilities. Building on that experience, this new model includes options for a variety of special needs sensors including blow switches, pressure switches, environmental detectors, and wheelchair fall detectors. 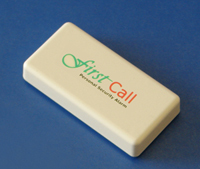 An optional user configurable activation delay is included to reduce the incidence of accidental calls, so this trigger device may be suitable for special needs clients who may otherwise experience difficulty with a standard alarm trigger. The transmitter is fitted with a very long life replaceable lithium battery which should not normally need changing for 5 -10 years. 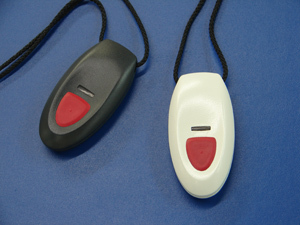 VCI supplies various special needs switches and sensors suitable for use with VCI triggers. If an access door or drug cupboard needs to be alarmed, used together with a security sensor, this transmitter is the perfect choice. The small transmitter is powered from a very long life replaceable lithium battery, and will not run flat if the door or cupboard is left open for long periods. The transmitter is also ideal for use with smoke alarms, environmental detectors, security detectors, and any other device presenting a contact closure on activation. VCI recommends purchasing security sensors from a reputable security supplier. Sensors must have a free normally-open (n.o.) output.